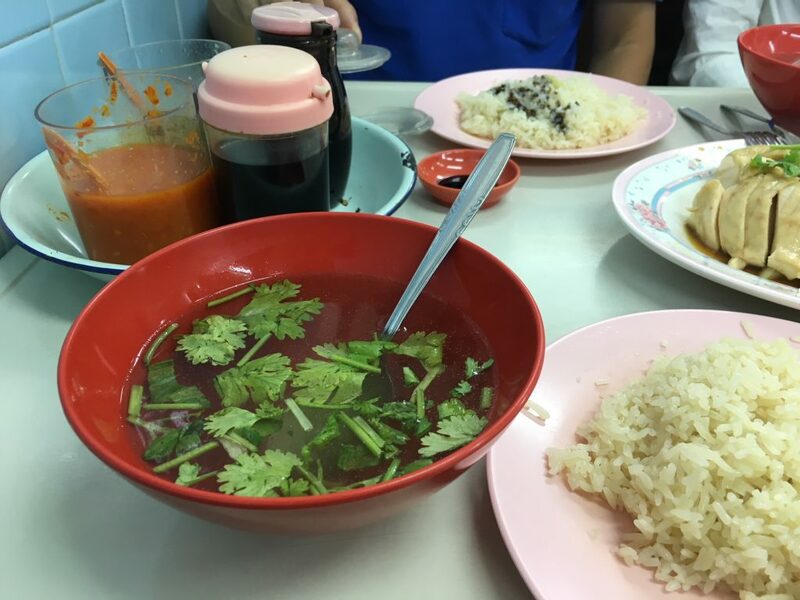 2 weeks ago, I wrote an article dissing pointless Singaporean foods like chicken rice soup and non-spicy otah. What started as a humorous shower thought quickly turned into my social media funeral pyre. Some wanted to defend the honour of the cucumber slice by fighting me, while others demanded my head on a spike for insulting their heritage. One of my friends even got so pissed that he ‘founded’ The Society For The Prevention of Cruelty to Chocolate Pratas—until the beer ran out, and his enthusiasm with it. Now that the dust has settled and I’ve come out of witness protection, my editors suggested that I should atone for my sins with some ‘serious journalism’. So they dispatched me to hunt down Singapore’s best chicken rice soup. I was not to return to RICE until I had completed this act of editorial penance. This turned out to be a lot more difficult than I expected. 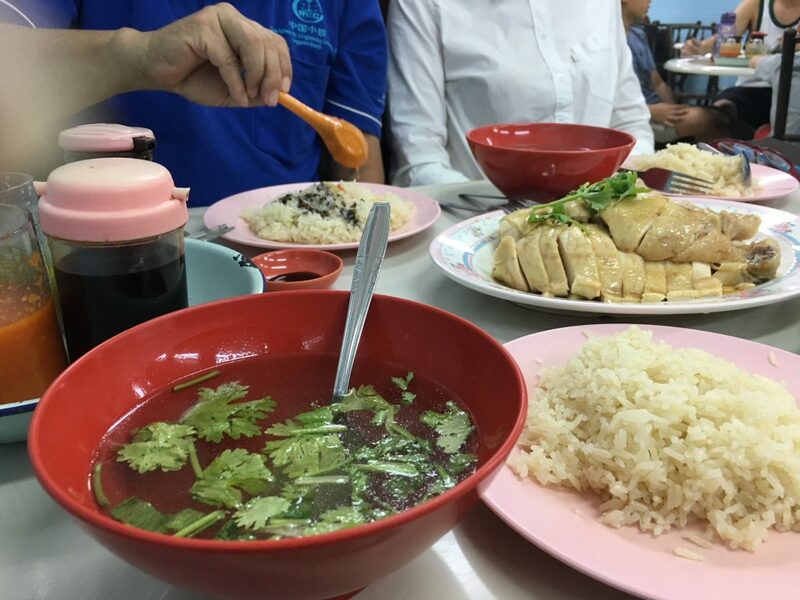 There are 9,897,455 listicles about the best chicken rice in Singapore, but exactly zero articles about the best chicken rice soup. As a result, I had to scroll through every single comment to look for leads. 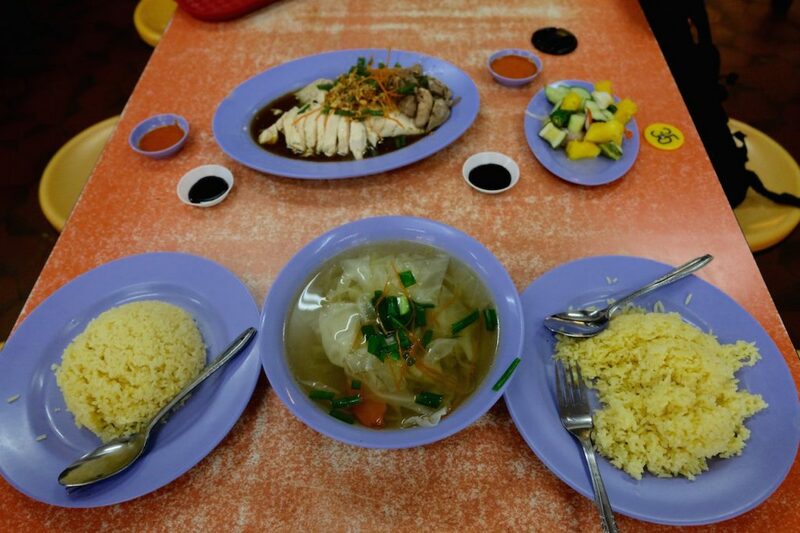 I also stared at pictures of chicken rice on Sethlui.com, looking for thicc-looking soups in the background until my eyes hurt. It was like the worst episode of C.S.I. meets Where’s Waldo. 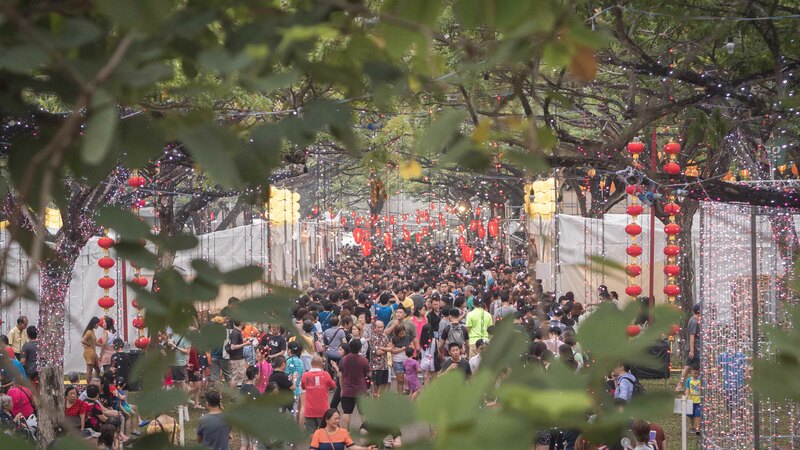 The first suggestion was Nam Kee Chicken Rice Restaurant on Upper Thomson road and it came courtesy of a commentator named Sarah. Unfortunately, this turned out to be a red herring because the soup was a pretty vanilla broth with some coriander sprigs floating on top. Don’t get me wrong. 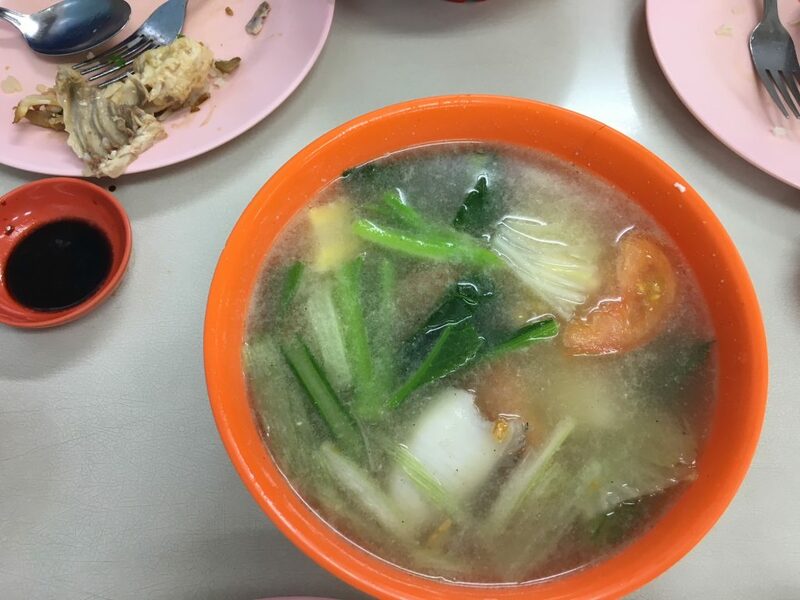 Nam Kee has some good soups on its menu and its vegetable seafood soup is pretty legit. 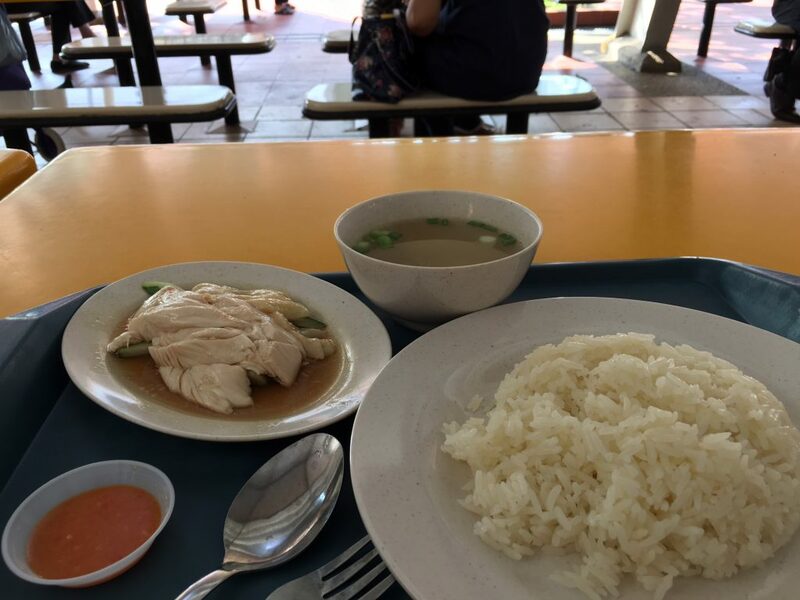 However, we can’t justifiably call it ‘chicken rice soup’ because you have to pay an extra $4 (or the price of an entire chicken rice meal) for the pleasure. Also, it contains sotong, fish and prawns. So despite its presence in a chicken rice restaurant, I have to categorically disqualify it. That being said, the food was tasty and Nam Kee’s homemade barley is a nectar for the gods. On to option #2, Chen Ji Chicken Rice in Tanglin Halt, which serves a rich, earthy soup made with chicken feet and peanuts. Some would argue that peanut chicken feet soup is a separate dish altogether, but I will happily overlook this if the stall doesn’t charge extra. Unfortunately, they do. The peanut chicken feet soup depicted in the picture above is not a complimentary bowl that comes with every set meal, but a specialty soup for which you have to pay extra. The stall has a daily soup menu that alternates between lotus root, winter melon, and peanut-chicken feet. The last item is only available on Mondays and Fridays. Their free chicken rice soup looks more like the picture below. 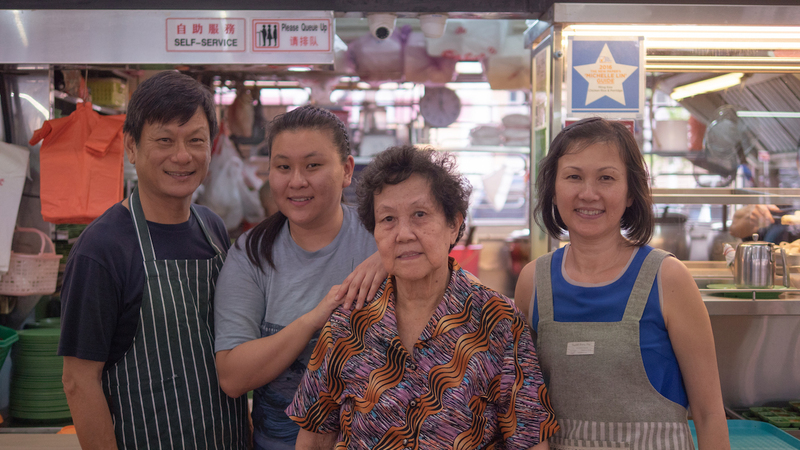 The stall-owner uses plenty of leftover parts to make the stock and it has a rich taste of chicken and ginger, but I can hardly crown it the nation’s best chicken rice soup in good conscience. So that leaves me with one last contender, defending the honour of Singapore’s chicken rice soup: Delicious Boneless Chicken @ Katong Shopping Centre. Katong Shopping Centre is a strata mall near Joo Chiat. It is about 90% domestic helper agencies and most regular patrons have long since departed for the newer and swankier I12 Katong just down the road. The promise of Delicious Boneless Chicken (DBC) and cake from Dona Manis are the only things keeping it alive as a culinary destination. Delicious Boneless Chicken is located in the mall’s basement food court. 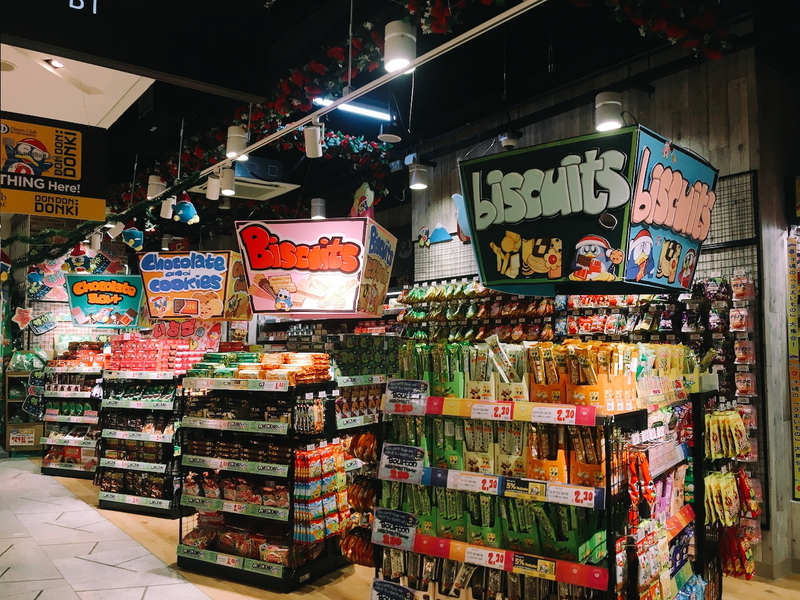 Although I call it a ‘food court’, it is clear quite clear that DBC is the only game in town. When I arrived at 11 AM, almost every single patron was eating chicken rice and a queue was quickly forming in front of the stall. And for good reason. 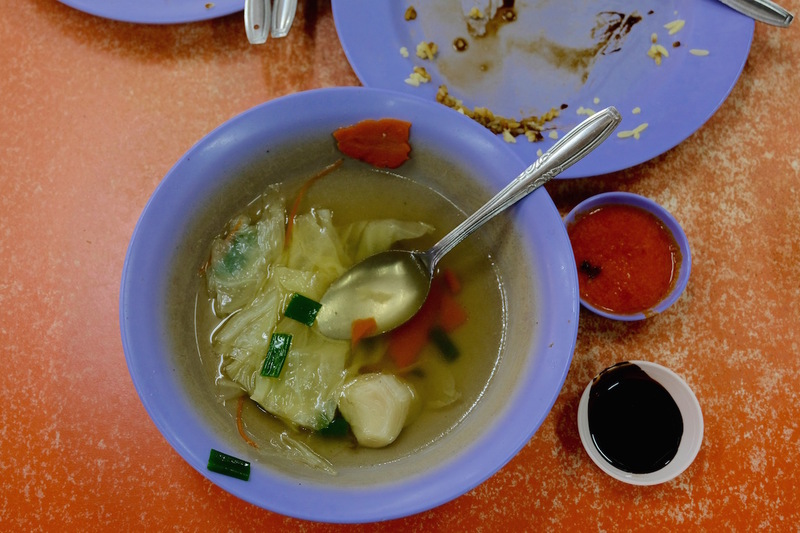 Their soup is no ordinary bowl of watered-down chicken oil, but a veritable vegetable harvest containing cabbage, radish, carrots and the mandatory scallions. It is also liberally seasoned with white pepper, which adds a kick to the soup that is absent in most MSG-heavy iterations. When broth meets tongue, the cabbage yields without a crunch, indicating that your soup has been stewing for some time to bring out the extra flavours. As a bonus, the stall also offers free refills and a lotus-pork-rib alternative if you’re sick of chicken. 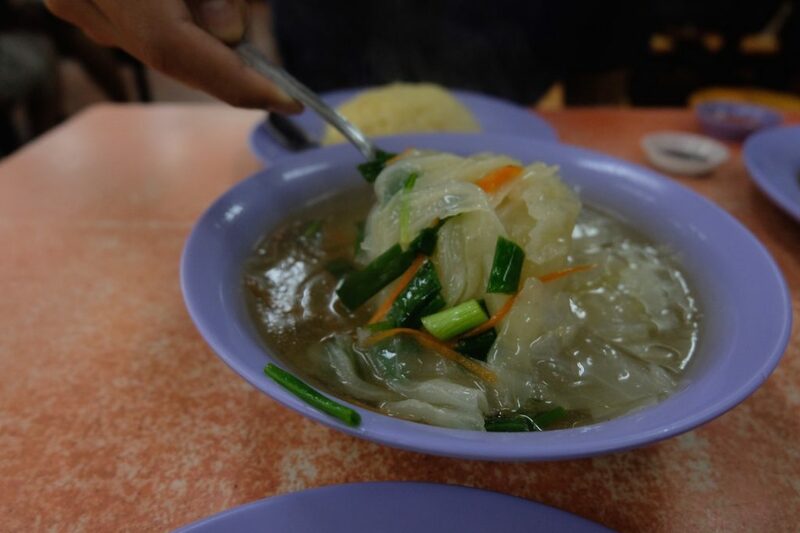 Although good enough to stand alone as a dish, the soup is nonetheless a perfect balance to DBC’s non-greasy rice. Clearly, much effort has been made and for the low price of $5, I got hearty taste of vegetable-infused liquid redemption. 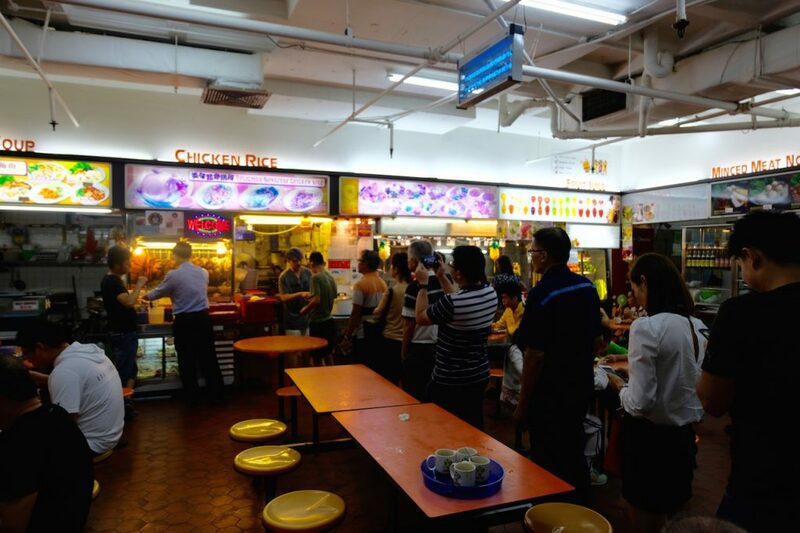 So, does DBC serve the best chicken rice soup in Singapore? I honestly don’t know, but it was the best chicken rice soup that my sleuthing unearthed. The truth is, most people do not bother that much with the soup. You can’t get away with bad chili or tasteless rice if you have ambitions of chicken rice stardom, but even a famous stall charging extra gets a free pass when it comes to the soup. Even at DBC where no expense has been spared soup-wise, I observed plenty of customers leaving their broth half-finished. In conclusion, good chicken rice soup exists, but as an anomaly rather than the norm. DBC’s supreme soup stands not as a rebuke to the overall trend of meh chicken rice soups, but as a stark reminder of unfulfilled potential, and of what chicken rice soup can be.